The efforts made by numerous organizations for world peace is growing. One of these organizations visited Mindanao in hopes of achieving world peace, and encouraged many local leaders to cease conflicts and work towards the development of the country. Peace is something everyone desires. Some organizations are putting in all their effort in hopes of achieving world peace. One of these organizations is South Korea's Heavenly Culture World Peace Restoration of Light led by advocate Man Hee Lee. 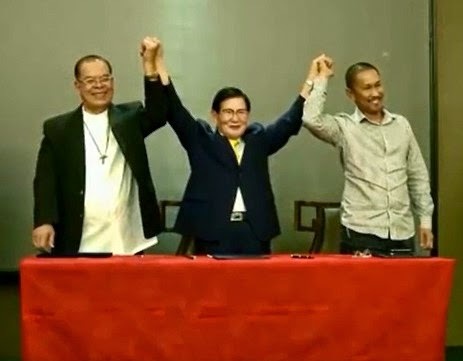 HWPL, Man Hee Lee advocate together with of IWPG visited the Mindanao region in the Philippines, to deliver a message about achieving peace and ceasing to many leaders. After their time in Mindanao, the delegation from the Heavenly Culture World Peace Restoration of Light returned to Manila where they hosted a World Peace Forum. Many religious leaders participated at this forum, and the chairman of Heavenly Culture World Peace Restoration of Light shared concerning the organisations plans to promote peace in Mindanao. And therefore I have met many current and former presidents throughout the world. The reason why I'm meeting all these leaders is to make possibility and make an achievement to stop wars. I'm asking all these presidents and dignitaries to sign an agreement to stop war once and for all. So I'm meeting not only the world leaders but also the religious leaders,because it is their responsibility to be a light to this world. We have one God and one will. It's not two wills.But why do we have to fight another and be divided like this? And that is why I came up with an idea to make Religious World Summit for Peace. WARP Peace Summit, this to bring many religious leaders together in South Korea.